We’ve always wanted a slow cooker and after spotting a popular ‘Hot Deals’ post on RedFlagDeals.com we jumped on the Hamilton Beach Set ’N Forget Programmable Slow Cooker from Amazon. This slow cooker is very simple and easy to use and clean. It comes with a thermometer probe for meat and is a good size to make meals that will last a few days. There are two settings for cooking: low or high. Once that is set, you enter the hours then watch as the timer counts down. We’ve made delicious beef stews and even fall-off-the-bone ribs! Who would have thought you could make some of the most tender ribs in a slow cooker. Put the ribs in on their sides, add some seasoning and let it go for 5 hours on high (finish them off in the oven slathered in BBQ sauce). 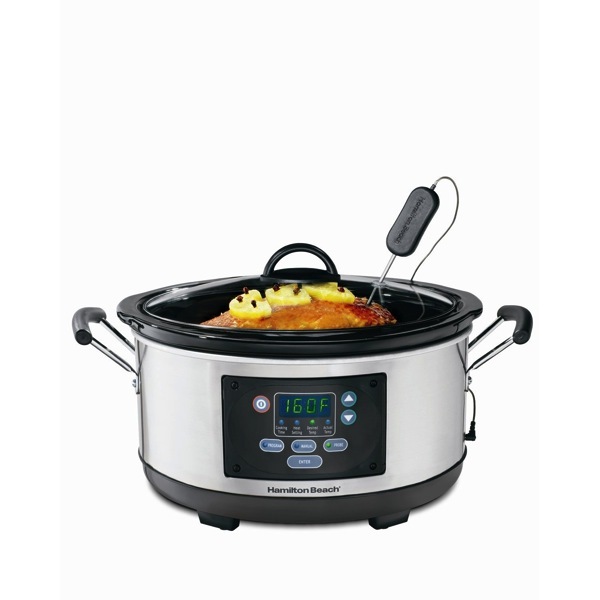 Check out this awesome slow cooker from Amazon.ca or Amazon.com.